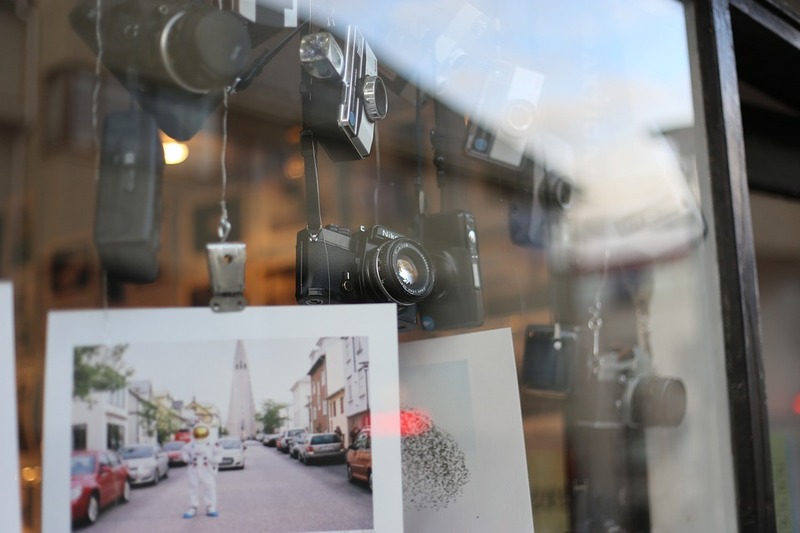 Homes use inkjet printers to print images. There’s no question that these types of printers can deliver quality images for home and school use. However, if you are a photographer by profession or your business is about printing high quality photographs, you need to buy the best photo printer available in the market because you have to ensure gallery quality photo printing. It does not make your (or other people’s) work look excellent in the eyes of others; it also builds a good image or brand. Photo printer and document printer differ on the type of output it can produce. The former is particularly made to print images and photographs that can basically compete with the quality of 35mm film print (or even better). It prints photos with details and precise colors and makes use of dye sublimation technology. It can work with any computer thus you are free to buy the best photo printer for Mac or the best photo printer for PC, similar to document printer. However, there’s an image printer that can stand on its own, printing photographs through memory card. This printer may not or should not be used to print documents as the quality can turn out to be awful. Sending images to the photo printer down to getting your finished print usually takes approximately 47 seconds for postcards, approximately 27 seconds for credit card size and mini stickers. You’ll be amazed as you watch how the printing process occurs, since it prints CMYK separately. This only means that the paper would be colored with yellow. After that, the cyan and magenta will be applied, before placing the black layer. Once done printing, the printer will eject the finished product on your paper tray. In terms of output print quality, it is much better compared to other printers out there. It is excellent in printing small items. This compact printer manufactured by Canon can print up to six by four inches or postcard-sized prints. Its resolution color is quite cool. The maximum resolution of this printer is 300x300dpi. 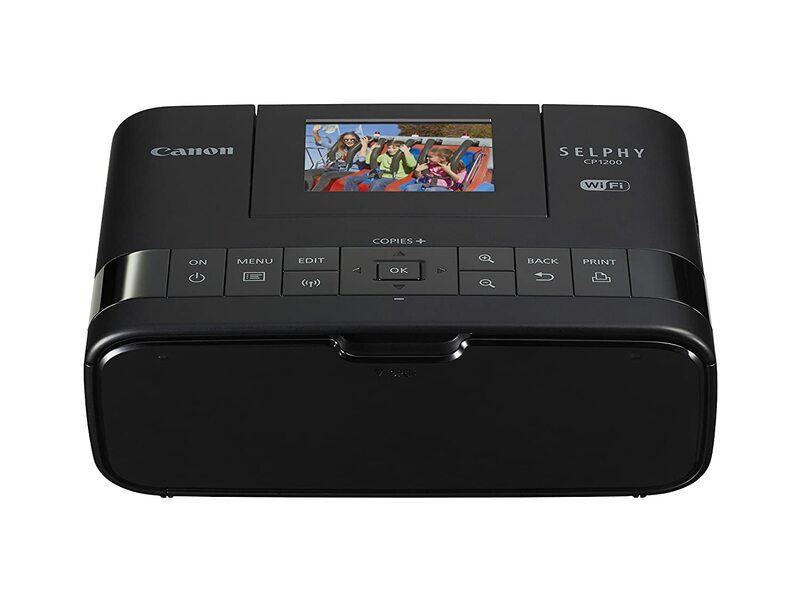 The Canon Selphy CP1200 has a dedicated Wi-Fi button to quickly connect to wireless printing. It also has Apple AirPrint feature to print wirelessly to your Apple devices. Canon Selphy CP1200, along with its great features, offers a winning mix of portability, convenience, and good print quality. Indeed, it’s a good investment! The HP Envy 4520 printer is capable of copying, scanning, and wireless printing. It also allows for mobile printing, which means that you can print from your tablet or smartphone with the use of the free HP ePrint app. It is also Instant Ink ready, which means that your printer always has ink. Your printer orders the ink, which is delivered to your home or office before it runs out. The HP Envy 4520 printer uses touchscreen technology, which enables you to easily and quickly copy, scan, or print with its 5.5 cm or 2.2-inch mono LCD display. It has a print speed of up to 9.5 ppm for black print and up to 6.8 ppm for colored print. 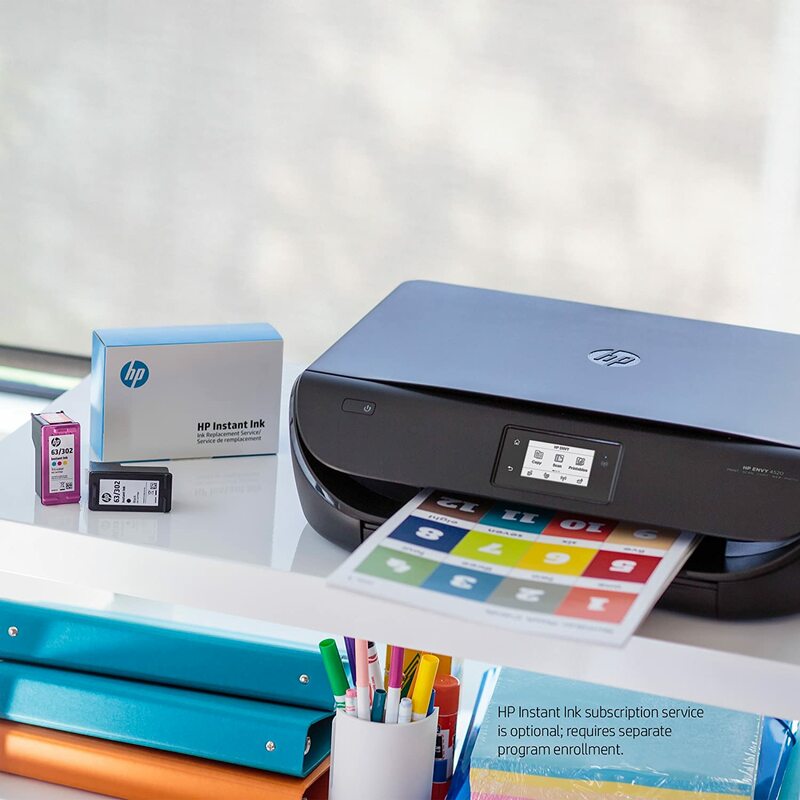 The HP Envy 4520 printer is capable of 2-sided printing and borderless printing. You can print on both sides of the page, which reduces your paper use by half. It can also print beautiful pictures with no trimming. In addition, it is capable of reducing and enlarging your photos from 25 to 400 percent. With its borderless printing feature, you will have no problem printing various photo sizes. In particular, you can print from 4×6-inch to 8.5 x 11 inch photos. 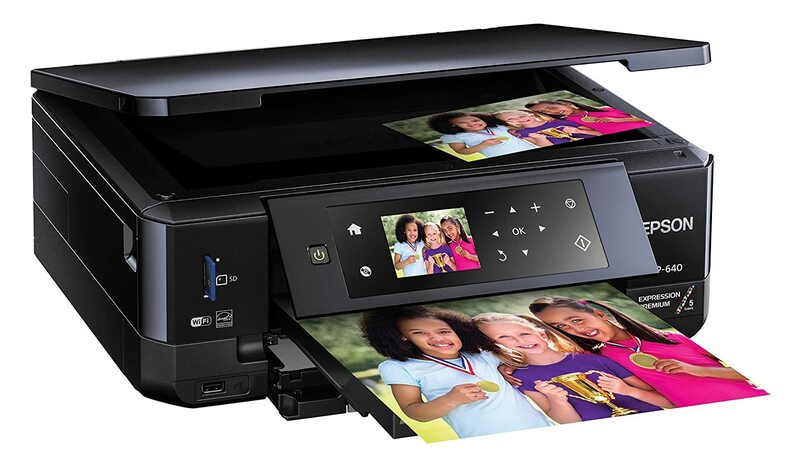 With up to 1200 dpi scan resolution, the HP Envy 4520 printer provides you with clear and sharp images on paper. The Epson XP-640 Expression printer is a wireless printer that is capable of producing sharp text and high-quality photos. It also has a 2-sided printing feature and allows you to print from your mobile devices even without a router. It has dedicated trays for printing DVDs and photos. It also comes with a 2.7-inch LCD and built-in card slots and USB to allow you to print even without a PC. It also allows you to easily print collages and Instagram and Facebook photos. With the Epson XP-640 Expression printer, you can print 4×6-inch photos in as quickly as 20 seconds. More specifically, it can produce black prints in 13.0 ISO ppm and colored prints in 10.0 ISO ppm. The Epson XP-640 Expression printer uses Claria Premium inks in printing sharp texts and pictures of laboratory quality. For borderless photos, this printer can print up to a size of 8 x 10 inches. The printer’s ability to create laboratory-grade photos is due to the amazingly high resolution of its print heads, which can provide detail of up to 5760 x1400 dpi. Save a significant amount of time printing photos from your devices – smartphone, iPhone, tablet or iPad. With Epson PictureMate PM-400, you can produce prints without the need to transfer them to your computer. With this wireless printer, you can simply connect through Wi-Fi and in an instant, you can already view the images on the 2.7-inch color display found in the printer. You can even edit your photos. This model of Epson printer is also portable and lightweight that you can easily transport it from one place to another. You will enjoy looking at the vibrant, full-color photographs. Not only are the pictures free from scratch, smudge and water; they can also last for at least 200 years that even the next generation can have a glimpse of the happy moments in your family. The actual printing speed is dependent on system configuration, page complexity and software but on average, Epson PictureMate PM-400 produces a 4” x 6” borderless print for 36 seconds. This printer has a maximum print reolution of 5760 x 1440 dpi. Pictures come out bright and vivid. 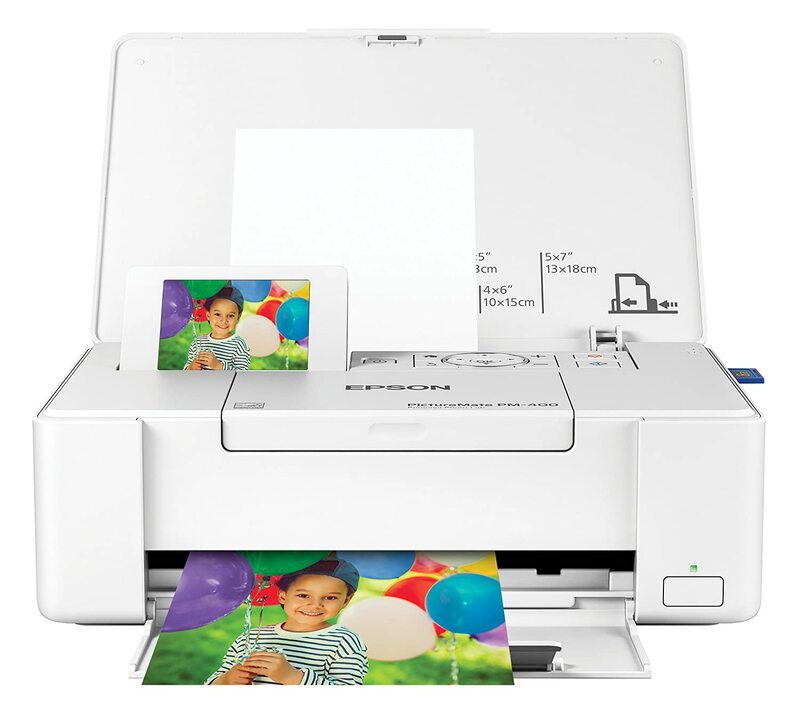 Epson PictureMate PM-400 prints out 4” x 6” and 5” x 7” photos from your iPhone, iPad, smartphone or tablet through USB, SD card or Wi-Fi connection. 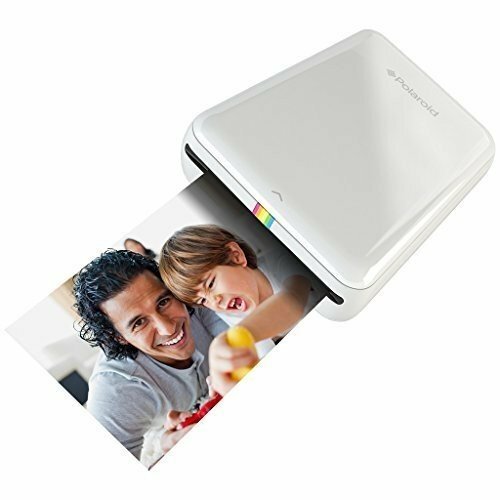 Polaroid ZIP Mobile Printer makes printing of photos from your smartphone or tablet a lot easier as you no longer need to transfer your images to your laptop or computer. You can simply connect it to your device via Bluetooth or NFC. Printing is without difficulty even because of the absence of ink. Smudge is a common concern among printer users, but Polaroid ZIP Mobile Printer does not rely on ink ribbons or cartridges thus you will not encounter the same problem. Instead, it makes use of ZINK photo paper that, when exposed to heat, will activate the color-forming molecules entrenched in the layers of the paper that will result in dry-to-touch photos. Some printers disappoint users with theirs printing speed – but not with Polaroid ZIP Mobile Printer as it can print sheets in only a minute or even less. Charge it for 1.5 hours and it is ready to produce 25 bright and colorful images directly from your tablet or mobile phone through Bluetooth or NFC technology. With Polaroid ZIP Mobile Printer, you can be assured of improved quality in your prints with their high-resolution colors. Using Zero Ink Technology, the peel-off, sticky-backed ZINK paper produces deep, brilliantly-colored and smudge-proof 2 x 3 photos. Images are also tear- and water-resistant. This wireless mobile printer (measuring 2.9” x 4.7” x 0.9”) uses 2” x 3” photo paper. The prints come out borderless. Polaroid ZIP Mobile Printer is your tablet or mobile device’s ideal partner. Everything is done in an instant. Just wirelessly connect your gadget and you are ready to print high-resolution and vibrant photos. If you need to print Instagram, Flickr or Facebook photos instantly, then this cool product, HP Sprocket Portable Photo Printer is an ideal gadget for you. About the size of a Smartphone, this device connects to your Smartphone via Bluetooth settings. It is a fun way to instantly print vivid 2×3 inch customized photos. You would need HP Zink 2×3 Photo Paper, which is stickable and durable. 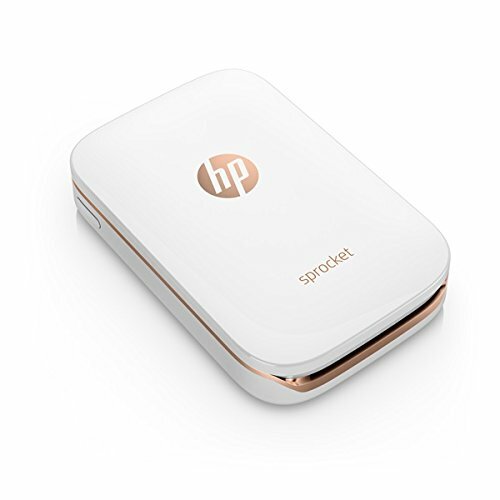 The HP Sprocket Portable Photo Printer is compatible with both Android and Apple devices. If you are a camera nerd and you prefer your photos in high resolution, you might think that the print quality could be better. The resolution color of this printer is 313 x 400 dpi. However, this printer is created for fun, with its borders, fonts, and stickers. The colors are vivid and clear, and you don’t have to wait for the ink to dry because it uses a new technology where the pigments are already integrated into the special photo paper. As soon as you load up the paper and click on the HP Sprocket App to print, the image will be printed in about 40 seconds. With less than a minute to print, the pictures come out at the least possible time. The photos are small, though. 2 x 3 inches is merely wallet-sized, so if you prefer larger photos, you might want to check out other printers like Canon Selphy CP1200. The stickable element of the photo paper is a real treat, though, and more than makes up for the small photos. 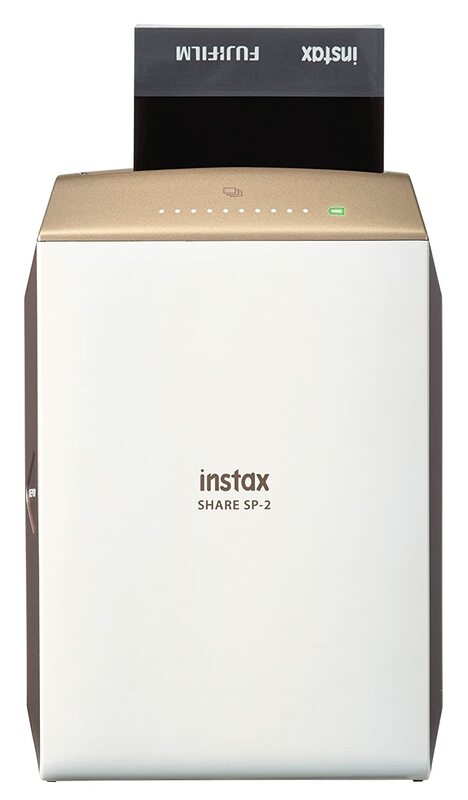 The Fujifilm INSTAX SHARE SP-2 Smart Phone Printer works in conjunction with the free SHARE app and is a stellar way to create your own instax photos. You are able to print your photos from your camera roll or social media directly from the app. The Fujifilm printer is the paragon of its kind and can be used to add a more personal touch to your daily routine. While some smart phone printers take seemingly forever to process the picture and finally print them, the Fujifilm INSTAX printer is unique in its incredibly quick printing speed. All of the transferring and printing is done within 10 seconds, with minimum noise, due to their advanced laser exposure technology. The SP-2 printer provides a rich, breathtaking color development and preservation experience for the user. Inside the printer, the instax system delivers light to pigments and produces chemical reactions to produce its vibrant color. Due to its anti-aging characteristics, these instax photos will be able to be cherished by you for many years to come. The SP-2 uses credit card-sized Fuji Instax mini instant film to make the print. While printing, the image is being exposed in the printer, and then develops once out of the printer over the next ten minutes. The film comes in cartridges of ten and must be replaced once depleted. The image size is 62mm x 46mm. The Fujifilm printer is superior in the caliber of photos that it prints; the high-resolution printer has print pixels of 800 x 600 dots and of 320 dpi (dots per inch). With such high quality, no aspect of your photo will be lost in translation from your phone to a print. Maximum Resolution Color – Printers today boast of different resolutions to enable users to exhibit their images in clear, sharp and rich and accurate colors, from 300x300dpi to 4800x1200dpi to 5760x1440dpi to 9600×9600 dpi. If you regularly print black and white images, you should also check the maximum resolution every photo printer offer for these types: 300x300dpi, 600x600dpi and 1200x600dpi, 1200x1200dpi and 2400x1200dpi. Printer Speed – This refers to the number of prints per minute (ppm), with standards ranging from 1ppm to 6ppm to 23ppm to 33ppm. Maximum Media Size – Which sizes of photos do you usually print? For home and small business use, 2×3 in, 4×6 in and 8.5×11 in prints are already satisfactory. However, if you are a professional photographer or a medium-size business that offers photo printing services, you may also consider looking for a large format photo printer that uses paper rolls and cut-sheet media of up to 13”, 22” and 44” wide. Memory Card Slot – A photo printer with memory card slot allows you to print directly from the unit, saving you time opening your computer and connecting it to the printer. Total Media Capacity – The number of sheets of paper a paper tray can hold should also matter to you. Some units can handle as many as 250 sheets of plain paper; some can also hold a maximum of 100 sheets of premium paper, which is as large as 17” wide. Photo printer reviews indicated that printing speed is not something that you should be worried about when looking for the best photo printer to buy because quality should matter most. But to somehow help buyers, they estimated that when a photo printer produces a 4×6 image output for an average time of two minutes, it is already acceptable. When talking about quality, the output should deserve space in a professional photographer’s exhibition: detailed and rich and precise colors. However, your preference may still depend on your requirement. You may be in front of two or more units of printers that slightly differ in output; it’s your choice which one is better or which one is already acceptable to your need. For professional-quality photo printing, inks for photo printers are not only comprised of four colors, namely the cyan (C), magenta (M), yellow (Y) and black (K). They also come in diluted versions – light cyan (LC), light magenta (LM), and light black (or gray). More often than not, inks are already available when you buy one unit. If not, you can ask the sales staff because they often recommend specific brand of inks for your use. Another aspect to look into is the types of inks used – dye inks for photo inkjet printers and pigment inks or dye sublimation technology for photo printers. Dye sub printers require accessories like carrying case, ribbon and paper case, paper (rolls or sheets), inks and others. What is your requirement and purpose for searching for the best photo printer? If your aim is to be able to print professional- and gallery-quality images, then you are at the right direction. Photo printers are not like inkjets as they use a particular technology (dye sublimation technology, to be exact), to make photographs come out almost like they are real – rich and accurate in colors and very detailed. They also have the capacity to print in the highest resolution available and in the largest paper size possible.